Many readers have asked, “Is there an ammo case that holds short BR, PPC and Grendel cases securely — one without a lot of extra clearance that allows fired brass to fall out of their slots if the box is tipped?” Yes, the J & J BR-100 Ammo Case fits BR, PPC, and Grendel cases just right. Many folks use the large green/red MTM 100-round ammo boxes for transporting 6BR and 6PPC ammo. The big MTM boxes work fine with loaded rounds, but not so great with fired cases. If you tip the MTM box on its side, the empties can spill out. That’s frustrating if you’ve meticulously sorted your cases. You won’t have this problem with the J & J 100-round BR-100 ammo case. It has tighter vertical clearance, so your empties won’t come out of their slots if the case tips over or is stacked upside down. 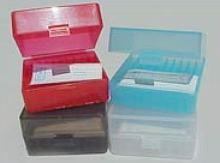 BR-100 cases are bargain-priced at just $4.88, and they come in Red, Blue, Smoke, or White colors. 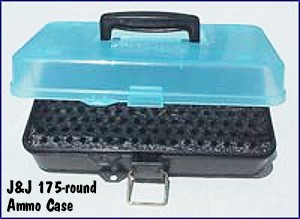 In addition to the BR-100 case, varminters who need to carry large numbers of loaded rounds should check out J & J’s 175-round Rifle Ammo Case (photo below). This foam-lined ammo transporter, item LR-175, costs $18.16 and is the largest-capacity ammo case we’ve found. For more info go to JandJProducts.Com. Share the post "BR/PPC Ammo Carriers Hold Cartridges Securely"
Putting some scrap polystyrene foam strip inside the MTM box lid cures that problem.